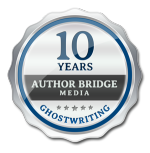 In the final step of writing your book, we write and/or edit your book's cover copy as well as the front and back pages so that your book stands out and encourages readers to connect with you. Turnaround time: 5 - 7 business days each service. to receive this $195 discount!